Original drypoint printed in black ink on laid Japan paper. Signed in the plate with the artist’s butterfly monogram lower right. A fine impression of Glasgow’s eleventh and final state, Kennedy’s ninth state of nine, of this a scarce and delicate drypoint, printed after the restoration and removal of the cancellation lines, and after the addition of the colon to the right of the inscription “I am Flo” circa 1879. Catalog: Kennedy 110 ix/ix; Mansfield 109; Grolier Club 100; Thomas 79; Glasgow 136 xi/xi. In 1864, Whistler was introduced by the painter Dante Gabriel Rossetti, his friend and executor, to his new patron, the Liverpool shipping magnate Frederick R. Leyland, who was to provide him with important commissions for the next thirteen years. It was during his visits to Speke Hall, the Leyland’s Tudor country house near Liverpool, that Whistler resumed his experiments in etching again, ending his seven-year absence from the medium. During a five year period, from 1870 to 1875, he made eighteen etchings and drypoints of members of the Leyland family and subjects in the vicinity of Speke Hall. Following his first extended visit to Speke Hall in 1869, Whistler became a close family friend of the Leylands, and returned with regularity for long visits until 1875. He was a great favorite with Mrs. Leyland and her daughters, and apparently entered into a brief engagement with Frances Leyland’s younger sister Elizabeth Dawson. In August of 1870 Frederick Leyland commissioned Whistler to paint his portrait in the style of the Spanish master Velasquez. It took Whistler three years to finish this portrait, but upon completion Leyland was so pleased that in 1873 he commissioned the artist to make a series of drypoints of his wife and daughters. This series of prints are among his finest productions of the 1870’s. 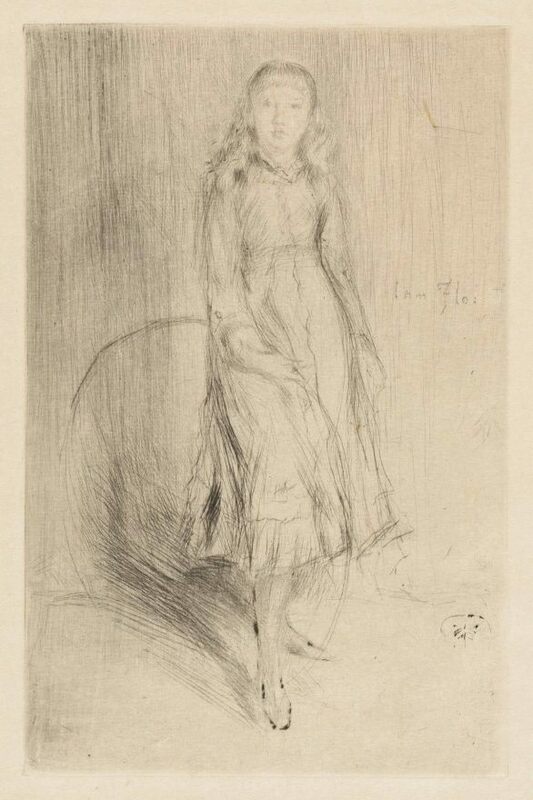 The drypoint portraits of the Leyland children, Fanny, Elinor and Florence, done at this time may have been intended as premières pensées (first ideas) for painted portraits or as substitutes for them, for the children could not bear the long sittings which Whistler required, and rebelled. In them he tried to capture the personalities of the girls while exploring the decorative possibilities of their costume. In “Florence Leyland,” Whistler’s primary interest was to explore chiaroscuro effects by drawing the shadows rather than the contours. The figure is attenuated and mannered. In each of the plates made at Speke Hall in 1873, Whistler employed his new signature for the first time. His rectilinear monogram which resembles a butterfly was composed of his interlocking initials, and was given an oriental shape which recalls the seals on Japanese prints. This heraldic device, which evolved in the late 1870’s into a small and sprightly butterfly, was placed with infinite care in different areas of the composition, its location dictated by Whistler’s sense of oriental balance and placement.